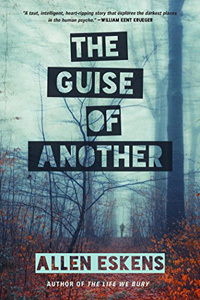 The Guise of Another by Allen Eskens, a Mysterious Review. Review: Minneapolis police detective Alexander Rupert, who as an undercover agent for Narcotics, had closed a case so adeptly and had received the Medal of Honor as a result. Now he is at a low point in his career as he is awaiting his time to face a Grand Jury regarding suspicion of corruption. He has been transferred to the Frauds Division, where his fellow officers barely talk to him. When a lawyer comes in to report a possible fraud case because a man who died in a suspicious automobile crash was proven to be using a false identity, Alexander is immediately drawn into the case, hoping that if he could solves it his reputation will be turned around, in The Guise of Another, a crime novel by Allen Eskens. The dead man was using the identity of James Putnam. Alexander first asks, Who is this dead man, and Where is James Putnam? He starts by looking into the victim and what may have happened to the person whose identity he was using. His investigation leads him to New York City, where he comes upon information on a fifteen year old murder case that at first had been called an accident. James Putnam's name was in that case. There had been a party on a yacht off Coney Island and there had been a dubious explosion involving an executive and a young man working for the Captain and two young women hired as "escorts". Putnam seemed to have disappeared during the investigation of that case and suddenly reappeared — dead. Is there a connection between that murder and Putnam's "accident"? Alexander finds one of the young women, who finally tells him what happened the night of the explosion on the yacht. What she reveals changes Alexander's life. He becomes the hunted instead of the hunter. As Alexander grew closer to the truth, danger threatens his life and those he loves. The Guise of Another is a novel layered in secrecy. The characters are well drawn, and the relationship between Alexander Rupert and his brother Max, also a police officer, is a complex one, but one integral to the story. The villain, a creative assassin adept at acquiring whatever he needs to accomplish his task, makes for a formidable foe. A quick read overall, and an intriguing, even enjoyable one, but be warned that some scenes are quite gruesome. Special thanks to guest reviewer Betty of The Betz Review for contributing her review of The Guise of Another. Acknowledgment: Seventh Street Books provided a copy of The Guise of Another for this review.